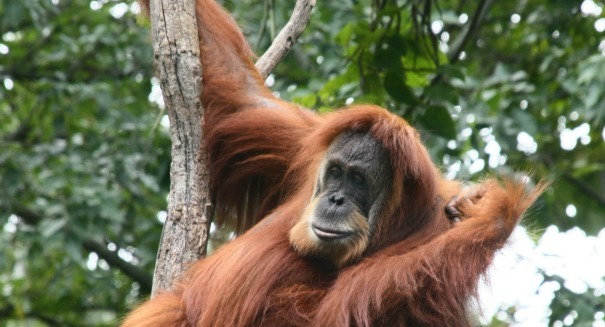 Scientists have found more than double the amount of Sumatran orangutans as originally thought. A new study has found there are way more Sumatran orangutans in the wild than scientists had thought. There are now believed to be about 14,600 Sumatran orangutans, more than double the previous figure. Scientists arrived at this number by taking a survey of ape nests, according to a BBC report. Apparently, past surveys just weren’t up to snuff — scientists think that this huge increase isn’t because of anything that happened to the Sumatran orangutan population, but because scientists had missed them in previous surveys. Scientists remain concerned about the species due to poaching and loss of habitat. The Sumatran orangutan is an important species because it is the only great ape in Asia. They can be found throughout Southeast Asia, but only on the islands of Borneo and Sumatra, and as the forests on these islands is threatened, so are the organutans. The previous survey had a count of 6,600 organutans. It was taken in 2004. When scientists did the latest survey, they found large populations of organutans in higher altitudes of the mountains, as well as in recovering forests that had been logged. Their findings were published in the journal Science Advances.